Yep, yet again I've decided to split this post into two because lets face it, no one is going to read an eight thousand word wall of text. Reading even the following four thousand words in one go is impressive! I wanted to keep the two posts somewhat even without splitting it right in the middle of a thought. So, this first half covers the rest of our time in Kamikōchi and our trip up to Mount Norikura. The second half will cover our walk in Mount Norikura and the rest of our day in Matsumoto. Well, as mentioned above we really wanted to cram a lot in to today so we had set our alarms and got up at the early hour of 6:00 am. Breakfast wasn't to be served 7:00 am and our plan was to get going quickly and explore some of the paths of Kamikōchi that we had yet to visit. We had covered the northern half yesterday so today the focus was on the walks south of our centrally located hotel (and the Kappa Bridge). Setting our alarms and waking up at 6:00am would give us around forty five minutes of walking time before we'd be due back for breakfast. After breakfast we'd then finish the rest of the walks before catching some buses up to the (near) summit of one of Japan's tallest mountains, Mount Norikura. At the top of the mountain we'd be able to do the three hour walk to the pinnacle and back before returning to Matsumoto by bus with hopefully enough time spare to visit Matsumoto Castle, which is one of Japan's three most famous. Getting back to our pre-breakfast time, we figured the best strategy would be to walk down along the western side of the Azusa River to the Tashiro Bridge and then back along the same way. The path on this side didn't continue any further than the Tashiro Bridge so by breakfast we’d have done the western side and could focus purely on opposite side later. The path on the eastern bank of the river actually continued much further down which means that it isn’t possible to walk around in a nice loop like we did yesterday. One advantage the southern half had though is that it contained the major access road for the buses with a bus stop located right at the southernmost point of the walking path. Our plan was therefore to check-out from the ryokan after breakfast and then enjoy the scenery as we walked down to the Taisho Bus Stop at the end of the path. This meant we had to carry our luggage all the way but as we’d left out big suitcases in Matsumoto we only had to worry about relatively light day packs. Right now though we had just woken up and got ready to go visit the western side! We went down to the hotel entrance to get our shoes and could tell that most other people were still inside, presumably asleep, since there were only a few slippers left at the entrance. We found our shoes, and most other peoples stacked inside the shoe room. It smelt a little bad but wasn’t really horrible. After swapping our footwear we went outside! Despite the early hour the sun was actually relatively high and had already cleared some low mountains. While the temperature wasn't freezing it was chilly enough for me to put on my fleece jumper and Kate her down jacket. The path we followed was gravel and ran alongside the Azusa River with some light forest on the other side The river looked beautiful in the early morning light and was a brilliant blue colour that was nevertheless transparent enough to show us the pebbly river bottom. In the background we could see the snow covered mountains that surround the Kamikōchi valley. The sky was a clear blue with the only clouds manifesting as light misty fog on the snowy mountain slopes. At one point along the path we were actually able to walk on the pebbly bank and inspect the river more closely. Apart from the Tashiro Bridge, the major attraction along western side of the river is the appropriately named Weston Relief. Well, it’s actually not cardinally named though, as the reliefee, Walter Weston, was only a reverend. What? I think I shoehorned that joke in quite well. Anyway, Walter Weston is credited with helping to bring mountaineering to Japan at the turn of the last century and is honoured in Kamikōchi and other mountainous places in Japan. As we continued along the path to the park containing the relief we came across another path that led off towards the mountains. It was a split board-walk similar to the ones we had walked along yesterday and although it didn't have a sign across it or anything we knew that the path didn’t currently continue all the way to the top due to snow. A little bit further on from the junction we came to the Weston Relief which was little more than a small metallic relief of Walter Weston’s profile and plaque attached to a rock. From the monument we continued on towards the bridge, though didn't end up walking all the way down as there wasn't really anything extra to see and we figured we could get a good look from the other side after breakfast. 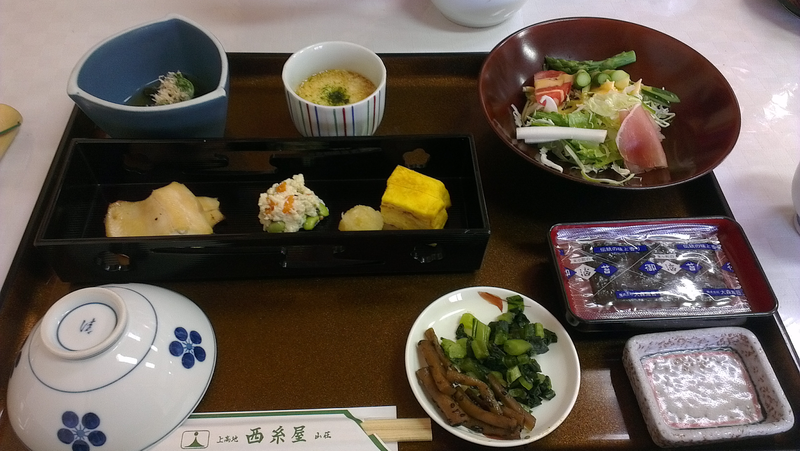 Instead, we returned back to the Nishi Itoya ryokan and waited for a short while on the seats outside for breakfast time. The air was really fresh and it was nice and peaceful. During our sit we saw that the girl from the couple next to us last night had gone for a run. When it was nearly time we went back up to our room and heard the announcement come over the phone again. Breakfast was served in the same room as dinner last night and was Japanese style with lots of small items. Unlike dinner, there was no menu so a number of things we ate remained unidentified. Though nothing was too strange. I quite enjoyed most things and was very happy. Kate’s verdict was that she didn't love it. I think she was mainly lamenting the loss of the hot western style breakfasts as she’d enjoy the past couple of days. After breakfast we collected our stuff from our room and went to check out which was a smooth and quick process. As mentioned earlier, our destination after Kamikōchi was the summit of Mount Norikura. The access road for the mountain goes up on one side and back down the other, so you can ascend from two different directions. One from the Hirayu-Onsen on the Gifu side and the other led up from Norikura Kōgen on the Nagano side. Both routes have limited access dates due to snow and currently in mid may only the road from Hirayu-Onsen was currently open. In fact, it only just opened yesterday. The Nagano road isn’t open for much of the year at all and buses are only scheduled between July and October. So, once again, we had to transfer at Hirayu-onsen and according to the timetable there were be plenty of buses travelling there from Kamikōchi today. Connections up Norikura were reasonably frequent as well. This meant that we were able to take it fairly easy along our walk as we would not be stuck waiting ages for the next bus. Spotted in last night's meal! That said, we didn’t want to go too slowly either as we wanted to have plenty of time at the top of the mountain. To get to the eastern side of the Azusa River we walked upstream to the Kappa Bridge, crossed over, and continued back downstream. After passing the bus stops and other building we continued on the path that ran alongside the river and through the forest. We had a bit of a closer look at some of the trees and plants as they looked somehow familiar and realised that many of them had featured in our meals at the ryokan! We enjoyed the scenery along our walk and before long came to the Tashiro Bridge. We took this opportunity to cross across and take some photos of the river. After the bridge we walked past some more more swampy areas (you'd never imagine a swamp could be so pretty) and then continued alongside the river via a boardwalk. A little further downstream we came to another section of the pebbly riverbank that we could walk on and saw a few stone towers. Japanese people really like to construct these and we’ve noticed in Japan that wherever stones can be stacked, stones will be stacked. Apart from the rocks, we also had another closer look at the river- it's really amazing how crystal clear the water was. Further ahead there was a decision to be made as the path split in two- one side led closer to the river and the other went off into the forest. We didn't have a choice though as we found the forest branch of the path was closed for some reason or another. We could see parts of the other path from ours and it didn't look like we were missing out on too much. There was some little ponds of water next to the trail and Kate got quite excited by some water bugs. They were skippers apparently and she told me "Look they don't break the surface tension of the water, it's awesome". I thought they were alright. Once the paths rejoined we walked along a boardwalk to a highly scenic spot, the Tashiro Pond (田代池 = Rice field + Change + Pond). Approaching the pond we walked through an area that looked like open grassland though if you looked closer you'd notice it was marshy. The pond itself was very beautiful, the water appeared quite orange but it was actually crystal clear and what we were seeing was just the colour of the sand underneath. We could go right up to the edge of the bank and saw within the water patches of moss. There were a number of small islands with grass and trees and the pond disappeared into a maze of islands and water channels in the distance. After the Tashiro Pond we continued along the river until suddenly the trees disappeared as we came out on a large rocky bank. This was the edge of Taishō-ike (大正池 = Big + Correct + Pond), the largest pond in Kamikōchi. It was formed quite recently when on Sunday, 6 June 1915 the nearby Mount Yake (焼岳 = Bake + Peak = YakeDake) volcano erupted and the resulting lava flow blocked the Azusa river. Volanic events in Japan are often named after the reigning emperor and in 1915 this was Emperor Taishō, hence Lake Taishō. I was surprised to learn that though it has been nearly one hundred years, trees from before the eruption are still standing in the pond today with their withered remains forming part of the scenic beauty. The pond evidently varies in size throughout the year as we encountered a sign at the start pointing out an alternate route if the riverbank was flooded. It also warned to be cautious about rising water levels. Taishō-ike is quite elongated in shape and after walking along the first bank we continued along a boardwalk. Off to the side on the slope of a nearby hill we could see quite a bit of snow. On the other size was a nearby island in the lake that formed a small channel. Within this channel we could see the reflection of Mount Yake and I had a go at taking a photo. The Taishō pond is famous for the amazing reflections of the nearby mountains you can view in its surface. Unfortunately though I wasn’t able to take any with the main pond. Eventually we came to the end of the pond and path and managed to locate the Taisho-Ike bus stop. At the time we were not one hundred percent sure if the bus would actually let us get on as the stop wasn't marked on the timetable we had. We were also unsure what to do about tickets but hoped we would be able to buy it on the bus. The bus was due to show up pretty soon and while we were waiting I had a look in small shop in the hotel opposite (the Taisho Hotel, I think). I was quite thirsty and decided on some grape juice that had sticker on it saying in Japanese "The same one served at dinner!". I figured that it must be pretty good for them to say that and bought a bottle. You can see me here! It was really super delicious! The only downsides were that it wasn't terribly big and was really expensive (¥450! IIRC). Right on time the bus turned up and we were able to get a numbered ticket as we climbed aboard. It was one of those standard sort of situations on buses where you pay according to your little ticket- with prices displayed on a big electronic display at the front. After a dark and twisty ride we arrived at Hirayu-Onsen and popped our fare and ticket into the ticket machine as we hopped off. We sure were a big “Dunno” with buses today! This time, we were not completely sure if the bus up to Mount Norikura was running. I'd looked on the website a few weeks ago and noticed that there was a message stating that a similar sort of bus had been delayed a few days due to excessive snow. I had a close look at timetable on display at the ticket window once we arrived from Kamikōchi and since everything looked great I used the ticket machine to buy ourselves return tickets. We still had a bit of time until the bus was due to leave which I used to investigate the Hyōka stuff I had noticed yesterday. Hyōka is a coming of age story about the four members of a classical literature club. Hōtarō has a knack for solving mysteries though the his main philosophy in life is to expend as little energy as possible. Hōtarō cannot however resist the persistent curiosity of fellow club member Eru Chitanda. The show doesn't get much more intense than Eru's "気になります (something's on my mind/I'm curious! = ki ni narimasu) and is wonderfully animated by Kyoto animation. On one of the shelves inside the shop I discovered a number of themed items for sale (And a drawing of Eru). I bought one of the foods for sale, which turned out to be a wafer biscuit. Also inside the packet was a collectable card! I also took a free pamphlet which looked to contain information explaining what all the fuss was about. Though I didn't get to read the pamplet or take these photo's until later in the day I'll solve the Hyōka mystery now, rather than make everyone wait until next week. 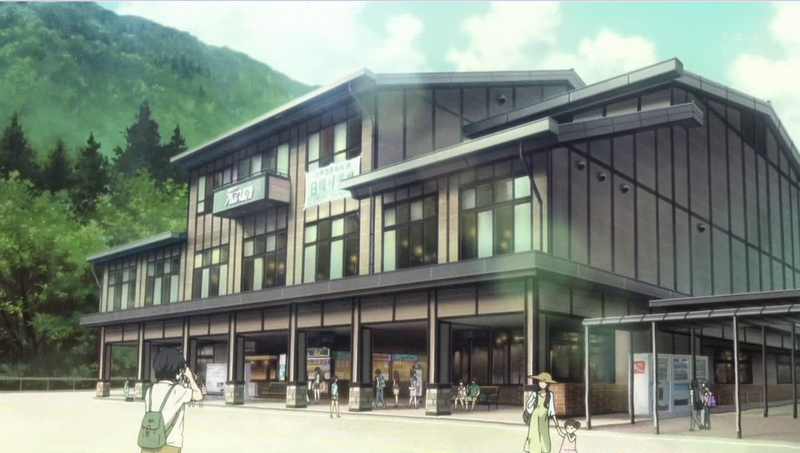 I learnt that the town featured in the original books and anime was based on the Hida-Takayama region and many of the scenes were directly inspired from real locations. The pamphlet contained information on how to visit (with a map) the different places that were featured in the anime. Takayama was the main focus though there were also a number of other places in the general region outlined. Which brings us to Hirayu. A visit to a mountain hot spring occuring in episode seven and this area was used as a model. The bus terminal building itself actually featured in the show and before hopping on our Matsumoto bus in the afternoon I made sure to run out and snap a photo! As always, I have a copy of the pamphlet and biscuit wrapper/card at the bottom of this post. Apart from the biscuit I also had a look around the rest of the shop and picked out some items for lunch. Kate had actually brought two days worth of food in Matsumoto yesterday so didn't need to buy anything extra here herself. Since we were going to go for a walk I made sure to buy a couple of bottles of Pocari sweat. This is a Japanese sports drink and it's supposed to replenish what you lose while sweating. It tastes better than it sounds. Our bus came on time and we took a seat towards the front. Before climbing the mountain we swung by the Honokidaira bus terminal where we saw even more cherry blossoms than yesterday! Also nearby, we spotted some ski lifts on the side of a completely snow free hill! I guess the area must see a fair bit of snow in the middle of winter. We then began to climb the mountain! The road up Mount Norikura is actually one of the highest in all of Japan and reaches a maximum height of about 2700 metres. As we climbed narration from the bus speakers told us that the road (the Norikura Sky Line) was originally built in the 1940's to provide access to an experimental aviation facility built during world war two. Like Kamikochi, the road is permanently closed to private vehicles and is only accessible by bus or taxi during the part of the year it’s open. The road continues back down the other side of the mountain upon reaching the top and can therefore be approached from either side. We were coming from the Gifu side because as mentioned earlier, it is open much earlier in the year than the Nagano side. Mount Norikura (乗鞍岳 = Ride + Saddle + Peak = NoriKuraDake) is the third tallest volcano in Japan and at 3026 meters tall it is one of the twenty odd mountains in Japan that exceed the three kilometre mark. It is only 167 meters shorter than the second tallest mountain in Japan (Mount Kita), compared to Mt. Fuji though it’s three quarters of a kilometre shorter. The reason Norikura Sky Line is able to almost reach the summit of Mount Norikura is due to the mountains gentle slope and because of this it is a popular location for hiking. It is by far the easiest mountain to climb out those in Japan exceeding three kilometres and is listed as one of Japan's 100 famous mountains (Japan is full of lists like this). As far as geology goes Mount Norikura is an active stratovolcano with eruptions that seem to take place every couple of thousand years or so. The journey up the mountain on the bus takes about an hour and is quite twisty. As we climbed we could see the snow increasing and by the time we were near the top the road had turned into a tunnel with high piles of snow on either side! We also started to climb into and then above the clouds. Right at the very top there were steep rocky areas that didn't have any snow and instead the rocks were covered with what looked to be some sort of mossy grass. According the bus’s narration this plant was actually a type of Japanese alpine vine. The overall scenery was really amazing and we could see clouds swirling around pinnacles that peaked out of the white snow. In the distance I spotted an astronomical observatory. Just before we reached the bus stop we saw some ponds of water in the middle of the snow! After arriving at the top and hoping off the bus we studied the timetable attached to the stop to check the times back to Hirayu-Onsen. It takes the same amount of time to get down the mountain and we had to be careful as the last bus from Norikura arrived at Hirayu-Onsen after the final bus to Matsumoto left. Once we worked out what the actual last bus get was we had a look around the station area. The buildings and general atmosphere reminded me of the Kawaguchiko fifth station although there were fewer shops and it was far less crowded. There was a big main sort of building near the bus stop with a restaurant on the second floor and souvenirs and information about the area on the ground floor. The other smaller buildings contained souvenirs and all shops sold hiking gear. Around the bus station there were a number of nearby small rocky peaks that people were climbing up. As mentioned earlier, the road and therefore station had only opened yesterday so there was still a bit of preparation work taking place; I saw one lady hacking at a thick layer of ice with some sort of pickaxe. She was part of a team of workers that were restoring one of the toilet blocks to working order. Unfortunately we really needed to apply some powder and although there were toilets in the big main building, you had to pay to use them. We actually managed to find some other toilets in a different building outside but they were pretty Spartan. It was pretty much pee in a bucket and wash your hands using water from a big tub that had been brought up especially. We didn't spend too much time looking around the station as we wanted to get hiking! We still planned to climb to the highest point of the mountain which according to Japan guide, would take us about an hour and a half. I do now note that the photos on that website had a lot less snow, although at the time we didn’t really think it would matter too much. As long as it was open! We didn't really have much in the way of a map and the area looked a little confusing so I asked at an information section in the main building if they had any walking/hiking maps. He fumbled around for quite a while and eventually said that he couldn't find anything for us. It was strange since they seemed to have all manner of tourism/information pamphlets about the area. Such as information on the types of flowers found in the area. So instead we just had to make do with a photo of one of the rough maps on a big sign outside. Next step was to locate the path! It was pretty much just white snow wherever we looked but looking carefully we were able to see a black line in the distance cutting through the snow. We had heaps of trouble trying to locate where it began and we eventually managed to find it at the bottom of a drop behind one of the buildings. Well first, there was no way we were going to be able to get down there. More importantly I guess closer inspection revealed that the apparent path was merely a long black pipe. It didn’t appear to be connected to anything at all and just ended in the middle of the snow. I wondered if it was something used to help melt the snow. Anyway, we had a closer look at the map and managed to locate the proper path in an obvious location next to the buildings. It led around the pond I mentioned earlier and there was a roped fence on either side to keep people on the correct path. Apart from the worry of having people wander off cliff edges or into crevasses without the rope you’d have no idea where to go as everything was covered in snow. The pond we were walking around was the Tsuruga-ike (鶴ヶ池 = Crane (bird) + ka + Pond) and seemed to be a major attraction. I don't know what process was responsible for its formation but considering that Mount Norikura is a volcano and it wasn't frozen I'd say it's associated with some sort of geothermal activity. Not to rule out melting snow though; I really have no idea. After walking along the snowy footpath for a couple of dozen metres we actually had to turn back as the bright sun on the pure white snow was completely dazzling to such an extent that even squinting was painful. We hadn't given up though, it was a temporary tactical withdrawal! Finally that hiking gear would come in handy! From one of the shops we were both able to buy sunglasses for around 1000 yen ($10) each and looking much cooler than usual we set out again! Next week's post will cover our hike up Mount Norikura and our trip back to Matsumoto to visit the castle and a bit of the city.